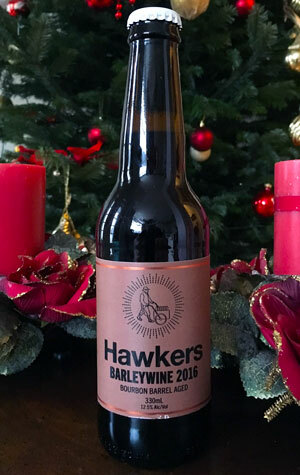 The only new beers to appear from Hawkers in 2016 were the brewery's imperial stout and its barrel aged cousin, with the former making our Best New Victorian Beers of 2016 list. At least, that was the case until now, with a second barrel aged beer snuck out just in time for Christmas. This time it's a barley wine, one that also spent time in bourbon barrels before being released into the wilds in time for festive sipping. It pours a rather gorgeous auburn, with the effects of the bourbon barrels apparent from the off, joining the kind of luscious malt derived characters you hope for in such beers on the nose: clotted cream toffee; sticky fruits; hints of all spice. They've clearly not held back on anything, including hops which, although not making much imprint on the aroma or flavour front, contribute a prominent bitter, dry finish. Presumably this is to give the beer longevity – the label says the beer is designed to be cellared for five or more years. And, while fans of big, boozy beers will find much to enjoy now, we suspect this beer will be all the better for cellaring, as the bitterness mellows and the flavours and aromas develop greater depth and complexity.